Impala Car Rental recently expanded its fleet with the addition of five Jeep Cherokee models and a few Toyota Hiluxes. Screenshot via Impala Car Rental. 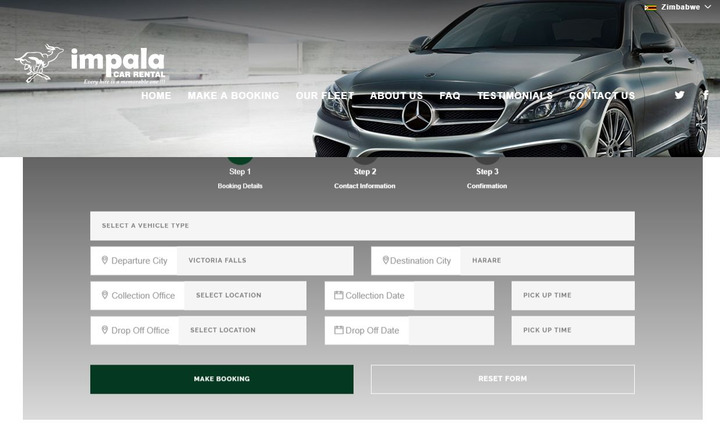 Zimbabwe-based Impala Car Rental opened a new branch in Victoria Falls, with the aim to open more in surrounding countries, The Standard Reports. Sales executive Tatenda Innocent Matiashe told the news outlet that opening in a resort town was necessary to secure its foothold in the areas growing tourism industry. Last year, the 11-year-old agency opened two offices in South Africa, in Johannesburg and Durban. Impala is reportedly considering opening another branch in Cape Town, South Africa, Lusaka, Zambia, and Botswana. Impala recently expanded its fleet with the addition of five Jeep Cherokee models and a few Toyota Hiluxes.